The capital of the fashion world has seen a certain number of exhibitions related to high fashion take place in its museums over the past year. As a non-Parisian French, I was lucky to spend my holidays in the capital last year. 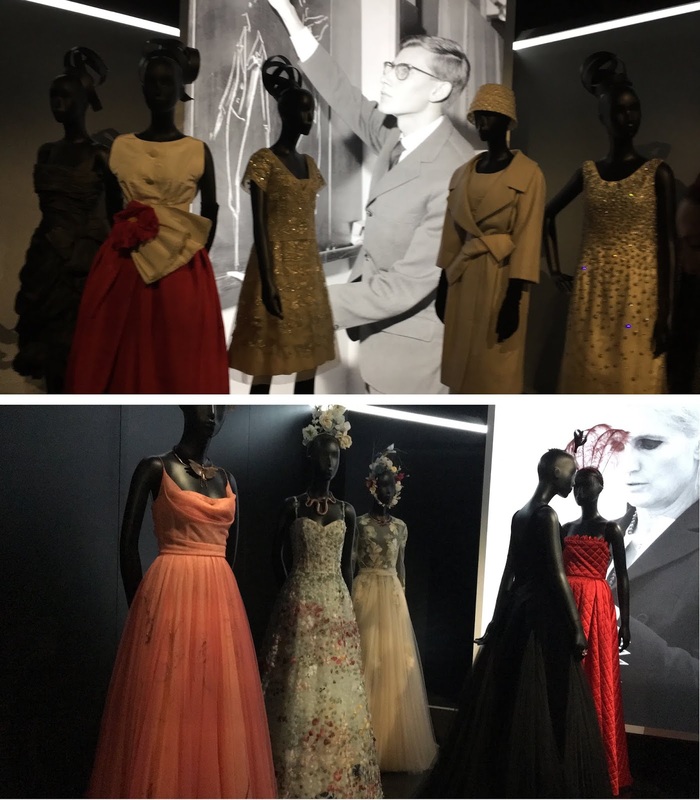 And like a proper tourist, I visited a couple of museums, including the Musée des Arts Décoratifs, which was happening to host the 'Christian Dior, couturier du rêve' exhibition ('Christian Dior, designer of dreams' in French). The first thing you notice is the quite long queuing it takes to get inside the museum, which can be up to a few hours and can be quickly discouraging. Luckily, it took me "only" about 30 minutes before getting in. The visit starts with a series of dark rooms and hallways, where you can see Haute Couture items, miniatures, and accessories displayed behind glass walls and cutely sorted by colors. The items rank from decades-old collections to modern ones. Further along the dark corridors, a couple of classic living rooms à la française are displayed, with beautiful, pastel or ornamented gowns on mannequins, painting a scene that could easily take place in a 16th-century French court, or in Marie-Antoinette's boudoir. The next room, the Jardin Dior, is inspired by the beautiful gardens of the house where Christian Dior grew up, in Granville - which is now housing the Christian-Dior museum. The room is stunning, with white and silver fake leaves falling from the ceiling, like an artificial garden, and color-changing lighting. 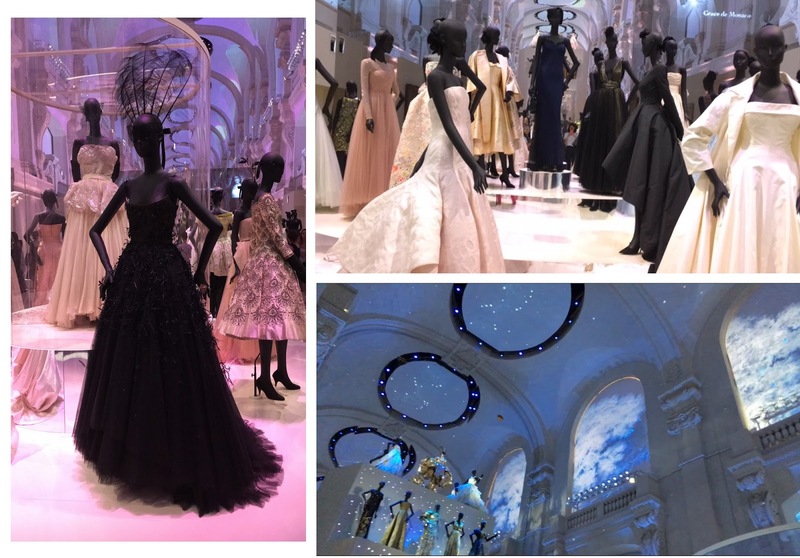 Following the theme, all the gowns displayed here are testimonies of how much flowers inspired Dior's style, whether it's in the shapes or in the patterns. At the exit of the Jardin Dior, old perfume bottles sit behind a display, with sketches and portraits of Sophia Loren, Grace Kelly and other muses framed on the walls. After a flight of stairs starts the second part of the visit. 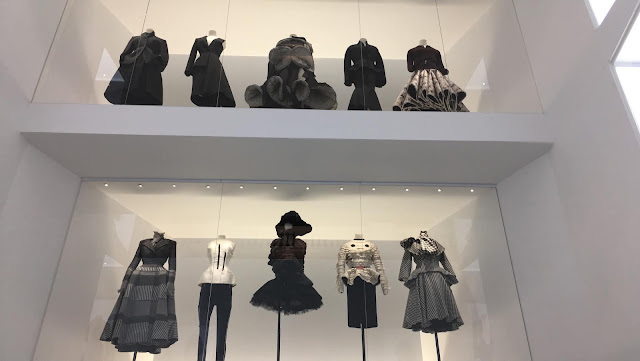 In the center of the museum, a room with a very high ceiling; and up to the ceiling, dresses, ensembles, coats on mannequins are put on shelves in the walls, making you feel like you're in a giant dollhouse. Next starts a series of dark, dimly lit hallways and rooms. Each room is a tribute to every artistic director who's worked at Dior, including the great Yves Saint Laurent, Gianfranco Ferré and John Galliano. For each director who's worked under the Dior label, a short biography is displayed on the wall and his best creations on a small podium. Finally, the highlight of the exhibition is displayed in the next and last room: the Bal Dior. The room is the biggest one, and clouds painted on the walls and light effects give it an enchanted feeling. Breathtaking gowns on mannequins, posing with an attitude, are stacked on podiums up to the ceiling, on spinning platforms or under small glass domes. This is a ball, so some of the mannequins wear masks. The lights' colors change on a spectrum that goes from blue to pink. The entire room looks so magical that people actually sit on small stairs to stay there and take a longer look at it. Such an exhibition reinforces the unofficial status of fashion - and especially high fashion and haute couture - as an art, sometimes meant to be admired, rather than utility. This year, Paris will host several exhibitions such as this one, including a tribute exhibition to Azzedine Alaïa, the Tunisian designer who passed in November 2017 at the Galerie Azzedine Alaïa, an exhibition about shoes through history and fashion, at Musée des Arts Décoratifs ; or a mysterious exhibition about backs in fashion, at the Musée Bourdelle.